Blog Should You Mist Orchids? Do This Instead! Orchids grow in nature in warm and humid conditions. Many people mist their orchids to try to replicate these conditions and help their orchids to thrive. But is misting your orchids a good idea, or could you be doing more harm than good? Should you mist your orchids? Most people should not mist their orchids. This increases the risk of the orchid developing a fungal or bacterial disease. There are better ways to increase humidity levels such as using a humidity tray or humidifier. But, misting orchids can be beneficial as long as you manage timing and ventilation to reduce risk. Most orchids will thrive best when humidity is between 40% to 70%. Low humidity levels can cause problems such as stunted growth, wrinkled leaves and deformed or dropping buds. Excessive humidity without adequate airflow increases the risk of your orchid developing fungal or bacterial disease. Can You Mist Orchid Leaves? You can mist your orchid leaves as long as you provide the correct conditions to reduce the risk of disease. Many people mist their orchids very successfully at home, and in the right hands, misting can help them to thrive and grow strong and healthy. Many commercial growers mist their orchids on a large scale to provide the best possible growing conditions. They carefully produce the perfect conditions for their orchids, including just enough heat, humidity and airflow to let their orchids grow quickly and to their full potential. This makes sense, as their aim is to produce wonderful flowering orchids for consumers, so the more stunning the blooms and healthy the plants, the more orchids they will sell. There are two main reasons why I don’t mist my orchids. Firstly, misting increases the risk of causing a fungal or bacterial disease to the leaves or stems of my orchids. Secondly, I feel that there are much better and safer ways to increase the humidity levels for my orchids. Using a humidity tray or humidifier will produce a more controlled and sustained increase in local humidity and this will reduce the risk of water pooling in undesirable places on your orchid. There are some good reasons why people mist orchids, and with it being a very popular thing to do when caring for orchids, there must be some clear benefits. Here are three reasons why you may wish to mist your orchids. This is of course the most obvious reason people mist their orchids. Most of us are told that orchids naturally grow in humid conditions and misting seems like a good way to replicate this. Misting only requires a spray bottle and is easy to do. It does increase humidity significantly, but the effect doesn’t always last for long. Orchid leaves and roots are adapted to absorb water directly from the air in humid conditions. When growing in the wild, orchids are often attached to the side of a tree, rather than growing in soil, so they need to be able to efficiently absorb water whenever it is available. Orchids are well adapted to absorb a lot of water quickly after rainfall. The rain runs down the branches of the trees they are growing on, but without soil to hold the water, it will be gone soon, so an orchid has to work quickly. In between rainfall, the orchid must make do with the water within the humid air of the forests in which they grow. Orchids are actually able to open the stomata on the underside of their leaves to increase the water absorption capacity of the leaves in highly humid conditions. In many ways, misting makes good sense, to provide natural conditions for an orchid living in an artificial environment. Many orchid growers use foliar fertilizer to feed their plants, rather than using a fertilizer solution when watering. This quite a popular thing to do for orchids, and it is somewhat effective, but is not really necessary. Firstly, orchids are perfectly capable of absorbing all the nutrients they need via the roots. Secondly, they are light feeders, so the amount of nutrients they need is actually quite low. Thirdly, foliar feeding leads to a build up of nutrient salts on the plant leaves, which looks unsightly and will block some sunlight to the leaves. You will then have to clean the leaves fairly frequently to keep them looking well. Whilst there are some reasons why you should mist your orchids, there are more reasons why you shouldn’t. Here are my six reasons why you shouldn’t mist your orchids. Having beautiful blooms is the main reason why people keep orchids at home, but fungal spots can ruin the look of the flowers. Water droplets from misting are a major cause of this. Water droplets on the petals, particularly in cool conditions will not evaporate quickly and a small area of fungal disease may develop on the petal. This is permanent and will remain for the life of the flower. I recently bought a phalaenopsis orchid at a local store than had this problem from day one. The orchid was packed with cellophane around it to protect it and closely packed with other orchids. I didn’t realize till I got home that a few of the blooms had unsightly fungal spots on them. Whilst this isn’t the end of the world, it does spoil the look of my blooms. I’ll have to wait till the next blooming cycle to get the flawless orchid flowers I love. This is the orchid killer you need to watch out for. If you regularly mist your orchids, some water will run off the leaves and pool in the crown and other areas between the leaves. There is a risk that the water that gathers here will not evaporate quickly, particularly in conditions which are common inside our homes. In cooler conditions, and in rooms with reduced airflow, evaporation is reduced. The water may sit in contact with the leaves and in the crown of the plant for a long time, greatly increasing the risk of leaf and crown rot. This water will quickly encourage crown rot to set in which can severely damage the plant. Crown rot will quickly destroy the base of the leaves and by the time it is noticed, it is often too late to save the plant. If you do mist your orchids, or water them from above, ensure to blot any water out of the crown with tissue paper. I’ve written an article all about how to water phalaenopsis orchids. But why don’t orchids in nature get crown rot? Orchids grown domestically do not grow in the same way as orchids grown in nature. Orchids growing in nature are not upright in pots, but are attached to trees, with their leaves hanging downwards at an angle. 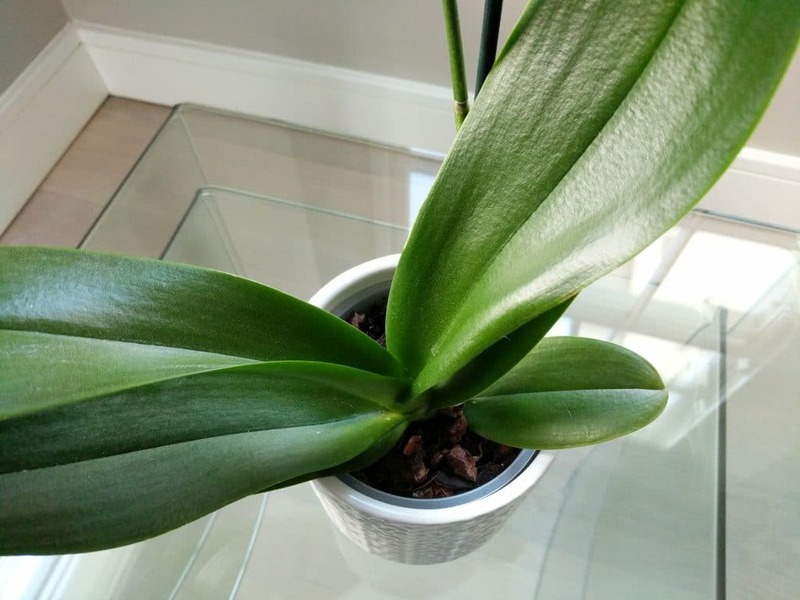 This causes any water that settles on the leaves of an orchid to run off away from the crown of the orchid and the risk of crown rot is minimal. There are more effective ways to increase the humidity levels around your orchids which can be done without increasing the risks that come with misting. Misting sprays fine water droplets around your orchid. A lot of these will land on the plant, and remain for a long time before evaporating, which increases the risk of fungal and bacterial disease. What you really want is water vapor, which will increase the humidity level of the air, not water droplets, which will sit on the plant leaves and flowers. I’ve got some suggestions for how to increase humidity the right way later in this article. 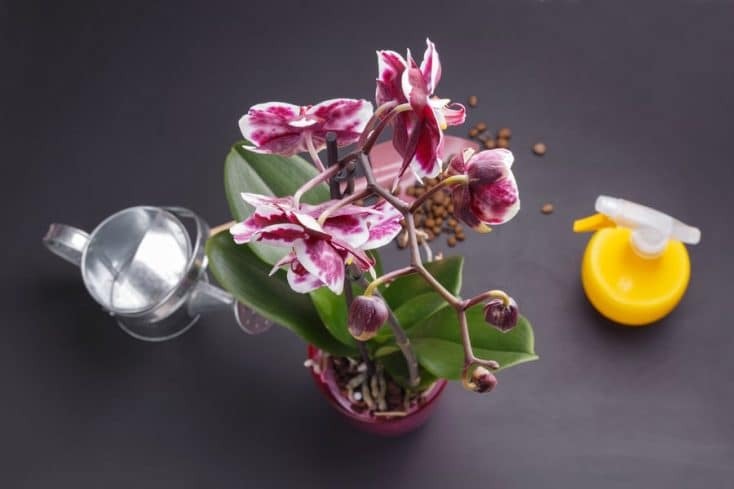 Most people who mist their orchids can only manage to do this infrequently, so the orchid gets limited benefit and it can even lead to accelerated dehydration of the plant. Misting your orchids creates a sudden and short-lived increase in local humidity. This causes the stomata on the underside of the orchid leaves to open. As the humidity levels around the plant drop rapidly after misting, the plant is at risk of losing more water than it gains due to the open stomata from the temporary increase in local humidity. Therefore, misting can actually lead to dehydration of your orchids in some circumstances. Orchids are adapted to rapidly absorb water via their roots when it is available. There is simply no need to mist orchids, as watering normally will result in the plant getting plenty of water. 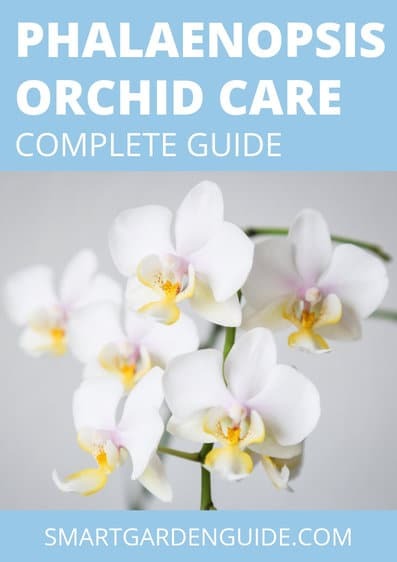 The best way to water orchids, particularly phalaenopsis orchids, which are the most popular variety in our homes, is to water thoroughly but infrequently. Just a few minutes exposure to plentiful water can result in a phalaenopsis orchid absorbing enough water to last for 1-2 weeks. This is the main reason why I don’t recommend misting orchids. Fungal and bacterial disease cause the death of more orchids than any other reason. This can be due to excessive misting and humidity levels, or overwatering, causing root rot. Err on the side of lower humidity and less water generally, and the risk of fungal and bacterial disease decreases significantly. Here’s my video about the pros and cons of misting orchids for a little bit more information on the topic. How Do You Keep Orchids Humid? So if misting is not a great option, how should you keep humidity levels at the perfect level for your orchids. Well, firstly, it may be a good idea to get a humidity gauge. These can be picked up very cheaply and will help you to monitor humidity levels so you know when action is required. If you need to increase the humidity level, I think these are the three best options. 1. Use a humidity tray to increase the local humidity levels around your orchid. Pick a wide drip tray and place a handful of pebbles on it. Add water to a level just below the top of the stones. Set your orchid pot on the drip tray. The roots won’t be in contact with the water, but the water will slowly evaporate, increasing local humidity levels, which the plant will benefit from. This is a better option than misting your orchid, but you do need to be careful as the standing water in the humidity tray can encourage algae, insects and disease. Place your orchid next to a group of other houseplants. As most plants are continuously absorbing water from the potting medium and losing water through their leaves due to transpiration, this will have a positive impact on humidity levels in the immediate area. Your orchid can benefit from the increased humidity created by the other plants. A third option is to get a humidifier. This is a good option if you wish to increase the humidity level of your home or room generally. There are many reasons why your home may have low humidity levels. Arid climates and central heating in winter can both dry the air in your home. Increasing humidity levels can have benefits for your plants, and also for you. As an added benefit, some humidifiers can monitor and maintain humidity levels within a range set by the user and can be set on a schedule, so they only operate when needed. umidity levels tend to peak at night and are lowest in the afternoon when sunlight and warmth are at their maximum. Bear this in mind when monitoring the humidity levels and particularly when providing supplemental humidity for your orchids. The other factor to consider along with humidity is ventilation. Higher humidity levels should be matched by increased ventilation. Stagnant, still air is an important reason why domestically grown orchids are more prone to disease than naturally growing orchids. In the summertime, we tend to have more ventilation in our homes due to opening windows, so this is less likely to be an issue. However, in winter, with our doors and windows tightly shut, your house may have very low levels of ventilation, which could put your orchids at risk. You may like to consider placing an oscillating fan in the same room as your orchids, to ensure sufficient ventilation. 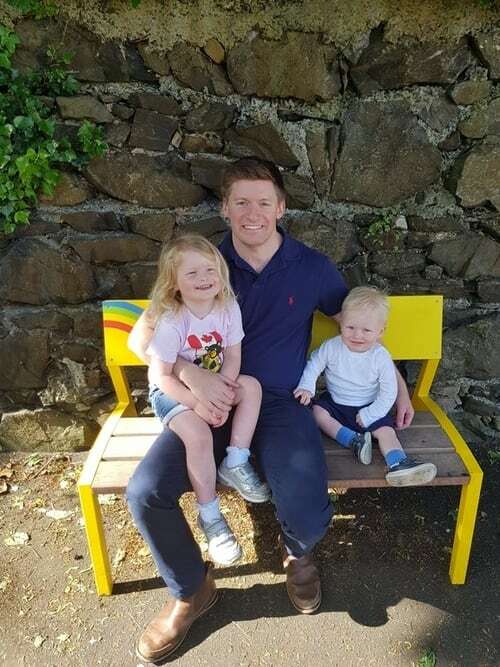 There is a happy medium to be had. Orchids like gentle airflow, but if the leaves and flowers are physically moving in the breeze, then that’s too much ventilation. Can I Keep An Orchid In The Bathroom? Bathrooms can be an excellent place to grow orchids due to the warm and humid conditions. Ensure sufficient ventilation to compensate for the increased humidity of your bathroom. Bright indirect sunlight is required, so bathrooms without windows are not suitable. Can Orchids Be Outside In The Summer? Most orchids can be kept outdoors in the warmer summer months, as long as their care needs are met. Sheltered areas, particularly under trees, in indirect sunlight are ideal. Just be sure to bring your orchid back inside well before temperatures drop again in the autumn.